Takeaway: Low turfgrass in front of dwellings have served many purposes over the course of human history. Our ancient ancestors kept low grass to better spot approaching danger, while in the 1500s lawns were used for recreation. Today, with arable land at a premium, environmental challenges, and billions of mouths to feed, Fleet Farming may be the future of the typical lawn. A fresh green lawn is a symbol of success to many. To others, it is a symbol of waste and environmental struggles. There are approximately 40 million acres of lawn in the United States. Many of these are fed countless gallons of water and treated with fertilizers and pesticides, all for the purpose of maintaining that picturesque Norman Rockwell visual appeal. A new movement known as Fleet Farming is changing that. Fleet Farming began with one goal: to reduce pollution by helping homeowners transform their lawns into sustainable food gardens. The idea was born in Orlando, Florida, by Heather Groves and Chris Castro, who started the original Fleet Farming organization. One of the main themes of Fleet Farming is that you don’t need to be an environmentalist to contribute to a healthy environment. There are three basic ideas behind how Fleet Farming works. The first is to set up home gardens, the second is to use pedal power, and the third is to sell the homegrown produce to local markets and vendors. Setting up a garden in place of your lawn is the first step. To begin, a home or property owner “donates” their lawn to Fleet Farming, which then turns the space into a vegetable garden. In exchange for the donation, the lawn owner receives a percentage of the harvest without having to tend the crop. Fleet Farming provides its own people to tend the crops through to harvest. The homeowner’s crop reward isn’t the only benefit; they can now sleep better at night knowing that they are contributing to a cleaner and healthier environment. When Fleet Farming says they employ pedal power, they really mean it. Fleet Farming calls on bicycle riding volunteers to join them in what they call “swarm rides.” During swarm rides, volunteers gather and ride around to a handful of farmlettes. “Farmlette” is the Fleet Farm term for a lawn that has been converted and is maintained by the organization. During their visit, volunteers tend the crops, teach new volunteers about gardening, and even transport produce to market using nothing but bicycle power and an attached mini-trailer. A key critique that Fleet Farming has about modern lawns is that it takes more than 800 million gallons of fossil fuels to mow all 40 million acres of lawn in the US. 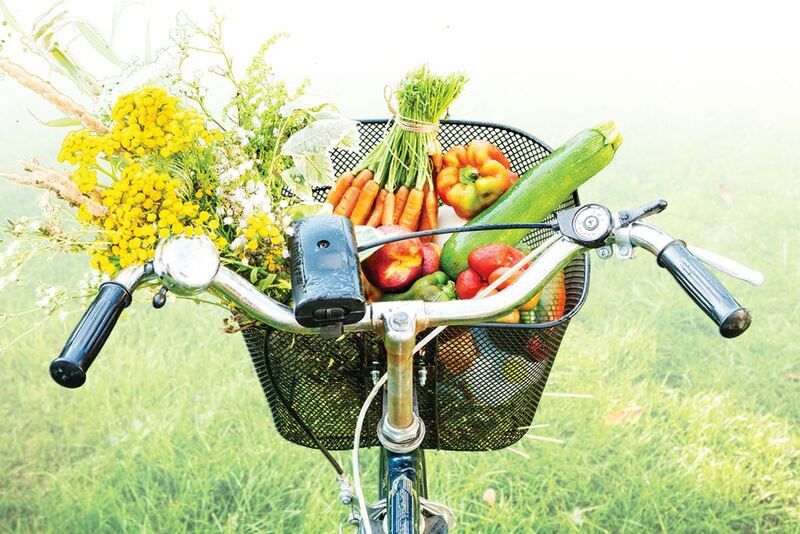 Transporting produce grown on farmlettes by pedal power reaffirms the commitment that Fleet Farming has to reducing carbon footprint and creating more sustainable sources of locally grown produce. To ensure the high standard they have set for themselves, produce grown on farmlettes can only be sold at farmers’ markets or restaurants within five miles of their place of origin. Currently, Fleet Farming produce is available at two farmers’ markets and one organic restaurant in Orlando. However, Fleet Farming has reached out to interested individuals around the world and has already set up a second community hub in Oakland, California. Oakland has embraced Fleet Farming, with five farmers’ markets and organic restaurants partnering with the organization so far. But Fleet Farming doesn’t stop there. The organization has expanded into the small towns and cities that surround Orlando, including Audobon Park, Colonialtown, and Winter Park. Fleet Farming is not only expanding its location base, Groves and Castro are also expanding its services. Besides the establishment of farmlettes, training, and education, Fleet Farming is moving into the world of fruit waste. Instead of allowing the leftover or forgotten fruit from backyard fruit trees to go to waste, one call to Fleet Farming and they take care of it for you. As they are a non-profit, all fruit donations made to Fleet Farming are eligible for a tax deduction as a charitable contribution. As it currently stands, as much as 33 per cent of climate change can be directly linked to our systems of food production. The majority of homeowners do little else but admire their lawns. Fleet Farming gives the average person a way to contribute to solving an environmental problem while reinforcing the strength of local markets. There has been a movement toward more sustainable agriculture over the past few years, and Fleet Farming is helping to lead the positive change.